When Ford unveils the all-new 2015 Ford Mustang, it will be a new global car unlike anything we’ve ever seen before. And the old platform which was called S197 by Ford will go into the history books forever. MustangsDaily has learned “from an anonymous inside source,” that Ford will change the platform name and will be called the S550 platform by Ford. Why is this significant? All the changes in the last few years to the Ford Mustang have seen the American car undergo changes in drivetrains and some design changes, but nothing compared to what the 2015 Mustang will undergo. Ford will launch the next-generation Ford Mustang on a global level and it will need to appeal to whole new buyer. Gone will be the days when the Ford Mustang will just need to go fast in a straight line. The changes to the 2015 Ford Mustang will be so significant, that a new designation is required. This will only be the fifth time in the Mustang’s 50 year history that the designation has changed. 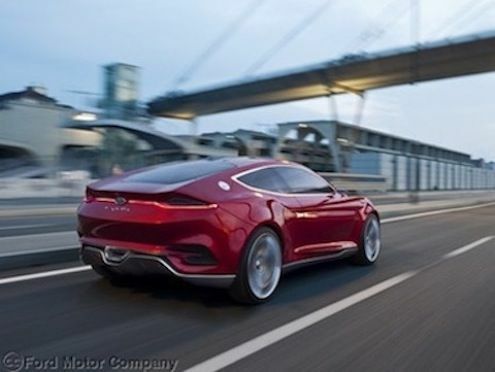 While we already new significant changes were coming for the 2015 model, this signals the fact that the new 2015 Ford Mustang is going to be a new global car that is very different from what we have seen in the past. Ford’s new strategy for the Ford Mustang will include making those here in the U.S. who grew up with the pony car happy with the new two-door coupe. But it will be also be sold in Europe and around the globe for the first time. Ford is making huge strides around the globe and has some of the most popular cars in Europe with the new Ford Fiesta leading the way. The new compact car is the best selling car in Europe and Ford has done it by offering smaller, lighter and more fuel efficient models including the Ford Focus. Underneath, the next generation pony car will receive major improvements and the old straight axel will be gone and replaced with a new rear independent suspension. A solid rear axle which is fine for going fast in a straight line down a drag strip, but the new global 2015 Ford Mustang will be sold around the world to a whole new buyer. The new independent rear axle set-up will be more responsive and improve the driving dynamics and appeal to the European buyer. Also set to help revolutionize the 2015 Mustang will likely be a direct-injected EcoBoost turbocharged 2.0-liter four-cylinder engine. The new engine will allow the 2015 Ford Mustang to offer outstanding performance and be fuel-efficient. Ford is already having much success with the small EcoBoost engines in Europe, and it’s ready to make its way under the hood of the 2015 Mustang. Shelby American just introduced a new Shelby Focus ST in Detroit with a EcoBoost 252 horsepower turbocharged four-cylinder powerplant. What is the future of the next-generation 2015 Ford Mustang? The new pony car will appeal to a global buyer and will be lighter, offer better handling and come with a smaller turbocharged engine that will meet the new emissions and fuel mileage standards around the globe. Bring it On! I was waiting outside the Ford dealership peering inside at the new white Mustang coupe, front and center on the showroom floor. It was the first day that the Mustang was going to be introduced to the public, I was there early in anticipation of getting some photos of the car before crowds made that difficult, I needn't have worried. Jump a head twenty years and I'm again at Ford dealership early in the day taking delivery of my new SVO, the first Mustang(with exception of the 65'-66' Hi-Po Mustang GT 2+2) that I deemed worthy of my hard earn dollars. That Mustang delivered. It is/was the only Mustang I have ever owned. With the new 2015 Mustang's emphasis on 4-cyl. performance coupled to an IRS, I will probably be waiting again, early in the day, for a new Mustang at another Ford Dealership, unless I buy a BRZ/FRS in the mean time.